Mix in oil, honey, turmeric, lemon zest and lemon juice. 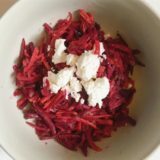 Top with goat cheese and serve. Nitric Oxide, or NO, found in beets helps with blood flow and circulation in our bodies. So much so, that reduced NO in our blood is common in people with heart disease. As we age, our bodies lose the ability to make enough Nitric Oxide. 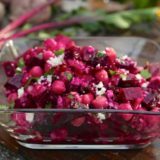 The best way to get NO from your diet is through raw beets. *Note: Natural Occurring Nitric Oxide in beets is different than the harmful nitrates and nitrites found in processed meats. Using an electric or hand grater, shred the beets, carrots and apples. If using a hand grater you may want to wear gloves to prevent your hands from being stained red.